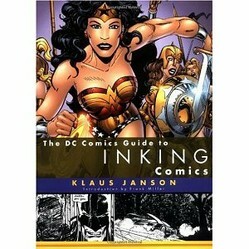 DC comics guide to inking comics is for inkers and how to ink comic books through technique and exact tips from professional comic book inker Klaus Janson. Ever thought about the inking process of comic books and ever wondered if it is similar to actually pencilling a comic book? Well in this book you'll find out that the inker is also allowed to be creative with applying the ink and creating a permanent ink line to all areas of the pencilled art and it requires you to understand some basic principles in inking with some valuable inking techniques that can make your art stand out in the world of comic book illustration. So whether you have to ink your own pencils or someone elses, the importance of the underlying inking techniques make it an important part of the comic book creation process. Klaus Janson a professional comic book artist takes you through step by step with actual black and white comic book ink art together with some original pencil art whish is shown in a before and after scenario which helps to understand the inking process and the many techniques you can apply to your art or someone elses. Everything is explored in this art book from light sources to creating texture with inks and from inking tools and equipment to exactly how to ink. After reading this book from cover to cover you'll find out how to ink and pick up various techniques for inking as well as some professional tips from Klaus on making a career as a comic book inker. The inspirational art samples taken from various comic books actually help you to study the way inks have been applied by comic book inkers and how some things could change for the better when the pencilled art has been fully inked. There are references to inking techniques throughout the book such as feathering which is a great method to master with inking and the deciding factor really is working out how you are going to start inking either with pens or brushes or both, it's a fun process as you can take your graphite pencil art to a whole new level and dimension by inking it. The chapter on to trace or not to trace examines the idea of deciding on either to follow the pencil art exactly to the line or to use creative license and add something more to the pencilled art. So, if you've ever wondered about inking and the exact process behind it then this book I highly recommend! Buy It!